There are a few species of prickly pear in the Santa Monica Mountains, perhaps most common are the coast prickly pear (Opuntia littoralis) and the chaparral or tall prickly pear (Opuntia oricola). Both have fleshy, spiny cactus pads (called joints; they are actually the stems of the plant) which make them easy to distinguish from other plants. The joints are flat and wide, shaped like small dinner plates and covered with spines. The points where the spines emerge from are called areoles. Waxy yellow flowers appear from April to June, forming along the edges of the fleshy pads. They are 2-3 inches in diameter and have many petals. Fleshy, pear-shaped red-to-magenta fruits follow. Called tunas, the pears are about 3 inches tall and nearly as wide, and covered in smaller spines. The fruit has a large scar on top where the flower had been. There are some small leaves that form before new growth appears, but the leaves fall off within a couple months and are not very noticeable. Chaparral prickly pear or Opuntia oricola has joints that are almost circular in shape, while the coast prickly-pear or Opuntia littoralis has more elongated joints, sometimes twice as long as wide. The coastal variety is more likely to form dense thickets, while the tall prickly pear can be tree-like. Another way to tell them apart is by their spines, with the chaparral variety having yellow or brown colored flattened spines while the coastal one's spines are white and round. The species names littoralis means "by the seashore" and oricola means "mountain-loving". The tunas are edible and sweet, and are usually prepared as either a drink or candy. The fleshy pads, removed of their spines, are also edible; you can often find them in Mexican or other well-stocked supermarkets, either fresh in the produce area or pickled in cans or jars and called nopales. They taste a bit like tart green beans. The joints were used in earlier times to treat skin lesions, soreness and swelling. The fruits had a variety of medicinal uses as well when taken internally. 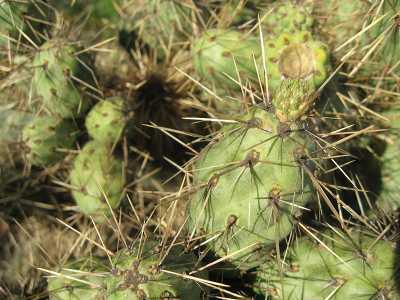 Wildfire is not kind to the prickly pear, although the interiors of the larger thickets are known to survive fire. New plants may be started by planting one of the pads which will then take root. Last modified: May 12 2017 16:41:09.